As we leave the first month of the new season, let’s look at which teams and players performed well enough to merit top honors. This is the first in a series of “Best of the Month” citations that will be based on the Efficiency Recap ratings on HoopStats.com. Team citations will be based on Efficiency Recap Difference (Team Efficiency – Opponents’ Efficiency), while Player citations will be based on Player Efficiency and his team’s Efficiency ranking. You can check out the Stats Glossary here. Chris Paul leads an awesome LA Clipper backcourt that also boasts of Jamal Crawford and Eric Bledsoe. And this is with Chauncey Billups playing just 1 game so far, too. become the best in the NBA. With both Kevin Durant and Serge Ibaka flirting with double-doubles on a nightly basis, it’s no wonder Scott Brooks has the best frontline in the NBA. They manage to edge out the big three of Memphis (Gasol, Randolph, and Gay) by just a bit. Spurred by their big comeback over Chicago, the Bucks’ bench rose up to be the best in the league. Coach Scott Skiles’s bench mob is led by Mike Dunleavy, Jr., Larry Sanders, and Beno Udrih. This just goes to show that a team doesn’t need big names to have a big bench. Despite not having Kevin Martin as a starter, the Thunder still have the best first five in the league. Durant, Ibaka, and Russell Westbrook have all been awesome, while Kendrick Perkins and Thabo Sefolosha have been solid role players. There is no questioning how Brooklyn and New York have risen to become powers in the East, but there’s also no questioning how Miami is still the best squad in the conference. Damn you, Ray Allen. Damn you. The Thunder are tied for second in the West with San Antonio (both behind Memphis), but, at least in terms of Team Efficiency, which is what I consider when I try to see which team actually “played better,” Oklahoma is slightly better. Westbrook is actually the PG with the third-best EFF, but he edges out both CP3 and Rajon Rondo because OKC has done better than both LAC and BOS. Team results factor in, remember? After all the Lakers’ struggles, Kobe still, by far, comes out as the best SG out there. James Harden, Dwyane Wade, OJ Mayo and Tyreke Evans all close behind Kobe, but all their respective teams, even Wade’s, aren’t doing particularly well enough to put them past the Mamba. gone through, is still the best SG in the NBA. KD beats out LBJ ever so slightly (James’s EFF is 29.2) because of his scoring, blocks, and FT% (89.3 – LBJ’s shoots just 65.9% from the line). Also, OKC is doing better in terms of DEFF – Miami has the fifth-best DEFF in the whole league behind MEM, LAC, and SAS. Wow. Oldie but goodie TD is still taking names. His Spurs are also doing well. They have the fourth best DEFF out West, but that’s still better than the DEFF of best in the East (Miami). Anderson Varejao’s EFF is extremely high, but team is DEAD LAST in DEFF, and that coupled with Memphis edging out Miami in the DEFF rankings means Marc Gasol gets the nod as the best center of the season’s first month. Chris Bosh, Dwight Howard, and Joakim Noah all have better stats, but, again, the Grizz have reaped the benefits of having a great center the most. MKG is way down in terms of individual EFF (he’s #80 overall), but he still has the highest EFF among all East freshmen. He’s also a big reason why Charlotte is currently ahead of Orlando and Washington in the Southeast. The top overall pick still has the best EFF despite his injury woes and Portland PG Damian Lillard’s boom-bust cycle. Also, the Hornets are actually playing better than the Blazers (in terms of DEFF). Just don’t look at the W-L slates. The King (bleh) has been his all-around beastly self, and there are no signs of slowing down. The only other East guys on the Top 10 EFF list are his own teammate, Chris Bosh, and Boston’s Rajon Rondo. KD is my pick for the Best in the West. He’s the ONLY guy right now who has a 30+ EFF rating. Looks like he’s gunning for James’s MVP title. If he keeps this up, and the Thunder keep on winning, then an MVP trophy and another Finals berth might not be far off. the rest of the field as the Best Player of the NBA's first month. Jason Richardson kept rising and firing from beyond the arc in the fourth quarter. Rarely did he misfire. Richardson nailed four of his six three-point attempts and netted 14 of his 22 points in the final frame as the Philadelphia 76ers tallied a 104-98 victory over the Charlotte Bobcats. Jrue Holiday recorded 13 points and a career-high 15 assists, while Evan Turner registered 25 points and 10 rebounds for Philadelphia, which has won three in a row and six of its last eight games. Ben Gordon had 19 points off the bench for the Bobcats, who have dropped their last three contests. Joe Johnson swished home a game-high 22 points on 10-of-16 shooting as the Brooklyn Nets knocked off the Orlando Magic, 98-86, on Friday at Amway Center. Gerald Wallace buried five 3-pointers en route to 20 points and Andray Blatche added 14 points and nine rebounds for the streaking Nets, who have won five straight. Deron Williams gave 11 points and seven assists, while Kris Humphries donated 11 points and seven boards to the victory. Glen Davis scored a team-high 16 points and E'Tuwan Moore added 13 points on 6-of-10 from the floor for the Magic, who have lost three in a row on the heels of a two-game winning streak. Andrew Nicholson and Nikola Vucevic donated 12 points in the setback. DeMar DeRozan poured in a game-high 23 points and pulled down eight rebounds as the Toronto Raptors held on to beat the Phoenix Suns, 101-97, on Friday. Toronto led, 95-89, after Mickael Pietrus' 3- pointer at the 5:49 mark, but a Sebastian Telfair layup and a Jermaine O'Neal dunk pulled the Suns within 95-93. After Amir Johnson split a pair of free throws, Shannon Brown's layup pulled the Suns within 96-95 with 2 1/2 minutes to go. Kyle Lowry's pass sailed out of bounds and the Suns took over with 51.4 ticks left. Luis Scola missed a spinning hook shot and Marcin Gortat's tip-in rolled off the rim, but Phoenix was able to secure the rebound and quickly called a timeout with 33 seconds to play. Scola took the ball on the left wing and posted up Andrea Bargnani. Scola faked a spin to his left, took a dribble to his right and put up a leaning jumper that rimmed out. Scola appeared to be fouled on the play, but the whistles remained silent. Lowry was then fouled, but the Villanova product went just 1-for-2 from the line to give the Suns another chance. Brown took the ball at the top of the key, took a dribble to his left, then attacked the basket, but couldn't get the layup to go. A pair of Bargnani free throws sealed it for the Raptors. Alonzo Gee scored on a putback of Dion Waiters' missed 3-pointer with three-tenths of a second remaining to give the Cleveland Cavaliers a 113-111 victory over the Atlanta Hawks. The rookie Waiters misfired from the top of the key, but Gee got position underneath the basket and muscled in a layup to snap the Cavaliers' road losing streak at eight games. They also posted their first win over the Hawks since April 2, 2010, ending a seven-game skid. Jeremy Pargo was one of three Cleveland starters to score 20-plus points, finishing with 22 on 9-of-13 shooting. Waiters registered 14 of his 21 points in the second quarter, while Anderson Varejao posted a double-double of 20 points and 18 rebounds. Josh Smith led six Atlanta players in double figures with a game-high 25 points. Reserve Lou Williams supplied 18, including a critical 3-pointer off an inbounds pass that tied the game at 111-111 with 13.6 seconds left. Al Horford had 15 points, 11 boards and five assists for the Hawks, who had won six straight. The Boston Celtics did just fine in their first game without Rajon Rondo, with Jeff Green scoring a season-best 19 points off the bench to lead the way in a 96-78 rout of the cold-shooting Portland Trail Blazers at TD Garden. Jason Terry added 17 points as Boston easily overcame the absence of its All-Star point guard, who was serving the first of a two- game suspension for fighting with Brooklyn's Kris Humphries in Wednesday's 95-83 home loss to the Nets. Paul Pierce amassed 12 points and eight rebounds to help the Celtics to their third victory in four games and sixth consecutive triumph over Portland. LaMarcus Aldridge was the lone bright spot in an otherwise brutal offensive display for the Trail Blazers. Portland shot just 34.8 percent overall and went 3-of-15 from 3-point range, while committing 23 turnovers as well to fall to 0-4 on its current 7-game road trip. Aldridge paced all players with 23 points and pulled down eight rebounds. Carmelo Anthony and J.R. Smith paced the Knicks with 20 points apiece, as New York easily defeated the Washington Wizards, 108-87, to stay undefeated at home. In the Knicks capturing their sixth victory in as many tries at Madison Square Garden, Tyson Chandler posted a double-double, finishing with 12 points and 10 rebounds. Ronnie Brewer also contributed 12 points while Raymond Felton poured in 11 in the victory. After claiming their first win of the season just two days prior, the Wizards looked completely overmatched on Friday and were unable to keep up with the Knicks' scoring pace. Jordan Crawford led the Wizards with 17 points off the bench. Bradley Beal followed with 14 and Kevin Seraphin posted 13 points and 10 rebounds in the setback. Mike Conley filled the stat sheet with 17 points, five assists, four rebounds and six steals in the Memphis Grizzlies' 90-78 victory over the Detroit Pistons. Rudy Gay tallied a game-high 18 points and Marc Gasol added 17 points and 11 boards for Memphis, which has won four in a row. The Grizzlies forced 22 turnovers, which led to 31 points. Greg Monroe had 17 points and nine rebounds for the Pistons, who had won four of their last six contests coming in. Alexey Shved had 16 points and five assists and Kevin Love posted a double-double with 15 points and 14 rebounds to lead the Minnesota Timberwolves past the Milwaukee Bucks, 95-85, on Friday. Luke Ridnour netted 16 points and Nikola Pekovic had 14 points and 16 rebounds for the Timberwolves, winners in two of their last three. J.J. Barea added 15 points and five assists in the win. Larry Sanders posted his first career triple-double with 10 points, 12 rebounds and 10 blocked shots for the Bucks, losers in five of their last six. Monta Ellis and Brandon Jennings each scored 18 in the setback. 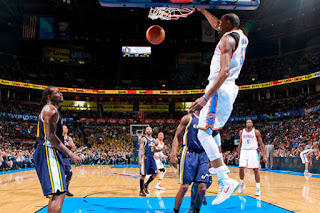 Russell Westbrook stuffed the stat sheet on Friday, netting 23 points to go with 13 rebounds, eight assists and seven steals as the Oklahoma City Thunder dropped the Utah Jazz, 106-94, at Chesapeake Energy Arena. Kevin Durant scored a game-high 25 points on 8-of-13 from the floor and Kevin Martin contributed 19 points for the Thunder, who polished off a 3-0 homestand and have won four straight and seven of eight overall. Serge Ibaka and Kendrick Perkins donated 12 points apiece in the victory. Enes Kanter scored a team-high 18 points and pulled down seven boards, while Al Jefferson added 16 points and 11 boards for the Jazz, who had a two-game winning streak snapped. Paul Millsap, Mo Williams and Gordon Hayward all netted 13 points apiece in a losing effort. David West scored a season-best 31 points on 13-of-20 shooting to help lead the Indiana Pacers past the Sacramento Kings, 97-92, on Friday. West hauled in 11 rebounds and was nearly unstoppable in posting his second consecutive double-double. After hitting the game-winner on Tuesday against the Lakers, George Hill tallied 25 points, eight assists and six rebounds in the victory for Indiana. Sam Young added 12 points off the bench for the Pacers. Coming off a loss to Minnesota, DeMarcus Cousins led the Kings with 19 points and 16 rebounds. Sacramento was without second-leading scorer Tyreke Evans, who sat due to a bruised knee. Marcus Thornton started in his place and finished with 15 points on 5-of-11 shooting. 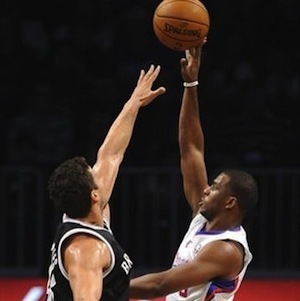 Jimmer Fredette and Francisco Garcia contributed 12 points apiece in defeat. Dwight Howard poured in 28 points and ripped down 20 rebounds, as the Los Angeles Lakers pounded the Denver Nuggets, 122-103, on Friday at Staples Center. 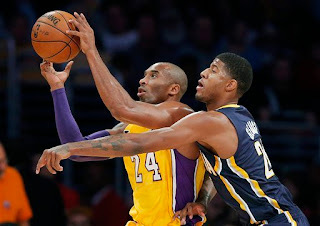 Antawn Jamison netted a game-high 33 points on 13-of-19 shooting and grabbed 12 rebounds, while Jodie Meeks hit 7- of-8 from beyond the arc en route to 21 points for the Lakers, who bounced back from a loss to the Indiana Pacers on Tuesday. Kobe Bryant finished with 14 points and eight assists and Metta World Peace added 10 points as the Lakers hit 17-of-33 from three-point range on the night. Danilo Gallinari scored a team-high 19 points, and Andre Iguodala added 14 points for the Nuggets, who have lost three straight on the heels of a four-game winning streak. Jordan Hamilton contributed 13 points in the loss.